1. You might remember a certain obsession I had with Friday Night Lights earlier this year. I don't know that I've ever been quite so addicted to a television show. Needless to say, I was pumped to see this list of Friday Night Lights trivia on Ali's blog!! Other diehard fans will get a kick out of the FNL related links she found around the web! 2. You guys know I love making ice cream at home, but I can't keep production up with the rate at which Ryan can eat ice cream. Since I'm always on a mission to fatten him up, I usually keep our freezer stocked with his store-bought favorites. I recently bought the Breyer's Blasts Samoas ice cream for him (I found it at Target), and snagged a few bites...oh.my.goodness. I pretty much had to hide it from myself in the freezer, lest I finish it all off before he returned from his business trip. 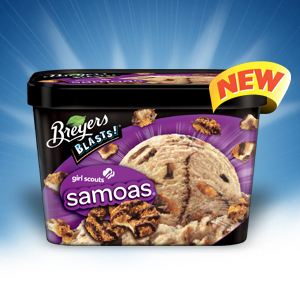 It's coconut caramel ice cream with a swirl of fudge and chunks of samoa cookies! I'll be recreating this next year during Girl Scout Cookie season! Two Years Ago: Eggplant and Mushroom Veggie Balls aka "Meatless Meatballs"